At Comfort First, we sell all kinds of products that are meant to improve the indoor air quality of your building and promote healthy indoor air quality. However, the importance of our products can easily be lost on someone who doesn’t have a solid understanding of why it’s important to maintain good air quality. Unfortunately, this problem is exacerbated by various myths and misconceptions that have long been floating around. It’s time to put these to rest. 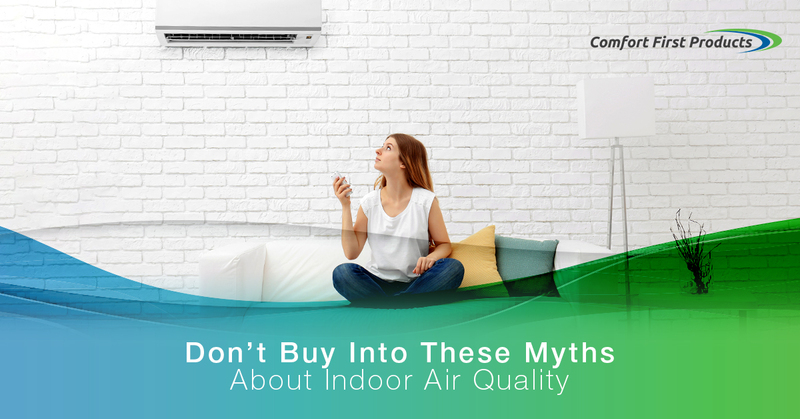 Don’t buy into the following myths regarding indoor air quality! From a certain point of view, this one could make sense on paper if you don’t think too hard about it. After all, the outdoor air in many cities is tainted by smog and who-knows-what, and a lot of people have the expectation that indoor HVAC systems naturally filter the bad stuff out. While HVAC systems do, in fact, filter harmful particulates in the air, the truth is the indoor air is almost always lower quality than outdoor air. The bottom line is that the air we breathe indoors comes from the air outside, so even if it gets filtered, we’re still breathing in the same air over and over as it circulates. And that’s not taking into account HVAC quality. If you haven’t changed your air filters in a long time, or invested in products such as air deflectors and vent diffusers, you could be lowering the air quality in your home or commercial building. And, finally, buildings have their own problems that you don’t always encounter outdoors. Mold, dust, pet dander, and pathogens all love to thrive indoors, and you can bet they will be circulated through your air system. With all these things considered, it’s easy to see why it’s so important to be proactive about maintaining your HVAC system. If this point were true, we wouldn’t be taking the time to write about it! Though, if that argument isn’t quite compelling enough for you, let’s break it down a little more. Bad indoor air quality can manifest itself in various forms, ranging from mildly annoying to a legitimate health hazard. People who have breathing problems suffer greatly from bad indoor air quality, as dust and pollutants can trigger asthma attacks. People who experience seasonal allergies can have regular reactions indoors if the HVAC system isn’t up to par. Meanwhile, harmful chemicals like mold can build up in your air vent system, creating a nasty odor, headaches, and respiratory problems. If it’s your home, being negligent about air quality is one thing, but it’s on another level if you’re the owner of a large commercial building or office space. Sure, you might be willing to cough every once in a while and deal with allergies, but do you want to be responsible for exposing countless other employees to that? People have different tolerances to air quality, so it’s best to prevent any major problems by investing in well-made indoor air quality products. We tend to have a subconscious habit of regarding newer things as better, or higher quality. But we advise you to not be deceived. Did you know that newer and “cleaner” buildings actually often have worse indoor air quality? First off, newer buildings are much more airtight than what came before. This has its advantages, such as being less susceptible to outdoor temperatures, but it also means that it’s harder for air to escape, thus resulting in poor indoor air quality as the same air is circulated over and over. Also, the construction aspect of new properties doesn’t do favors for your air quality. Paint fumes and formaldehydes have a tendency of getting into the air, and the building will actually need some time to totally rid itself of the pollutants. If you’re a commercial building owner, it’s important to remember that your air quality might not be good just because your building “feels” nice, so make sure to get it checked as soon as possible! Many people believe that they’re under the whim of their building design when it comes to airflow. In other words, they resign themselves to the ventilation design of the building, when in reality, there are many things that can be done to have some degree of control over your building’s airflow. Consider a vent deflector. You’ve probably seen these all over various commercial buildings. Vent deflectors create an angle or slope right underneath an air vent, which guides the air flow in a certain direction. This is useful, because sometimes if you do nothing, the air being circulated by your HVAC might end up congregating in a corner, or blowing disproportionately hard on a certain region of the office. By making wise use of vent deflectors and air diffusers, you can create even airflow throughout your building, something which ultimately can benefit the indoor air quality! It also ensures that, if you have any problems with your air quality, that they’re not being forced upon one specific region of the office, resulting in employees who routinely experience worse air quality than their coworkers. Close, but no cigar. While it’s absolutely true that your air filters should be regularly replaced, doing it once a year is not nearly “regular” enough. Air filters, especially the ones that are found in commercial buildings, filter out a whole lot of contaminants, and if you leave them sitting there for months and months at a time, you can bet that they’re going to build up with pollutants, resulting in less efficient air flow, and more particles “breaking through” the barrier, which ultimately reduces air quality. We would suggest replacing your filters every two to three months. Fortunately, if you’re the type of person that has a hard time remembering mundane maintenance jobs like this, you can subscribe to our air filter subscription program, where we will routinely send you new filters! This will ensure that you have a solid reminder every few months to change your filters, and your indoor air quality will be all the better for it. The best thing you can do to promote good indoor air quality is to invest in products that will facilitate healthy and productive airflow. We call ourselves “Comfort First Products” for a reason — it’s because our HVAC components have a profound impact on the indoor air quality of your commercial building, resulting in a comfier, healthier, and safer environment for you and your employees. Browse our selection today!